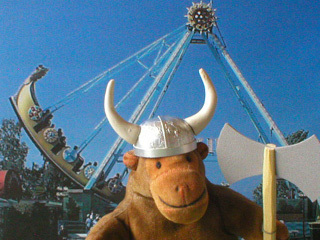 "It's not my idea of a Viking ship, really"
Mr Monkey wears his horned Viking helmet of comedy whenever he wants to make people think that Vikings had horns on their helmets. And whenever he mistakes an amusement park ride for a real ship. When he wants people to stop chuckling, he agrees that Vikings didn't have horned helmets, and puts on his proper Viking helmet. 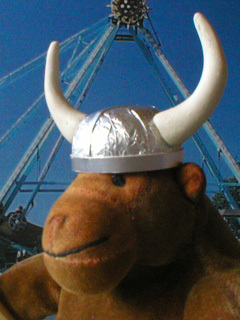 Mr Monkey's comedy Viking horned helmet is made from the one end of a Kinder Surprise toy container, covered with tin foil, and with horns made from Fimo. His foam axe is made from foam board and a short length of square beading, trimmed a bit.